The Fibroids Project presents the first citywide Uterine Fibroids Online Conference on Saturday, June 14, 2014, focused on the Philadelphia tri-state area and the Delaware Valley Region with the attendee expectancy of over 1,000 African-American women. The City of Philadelphia will host the Uterine Fibroids Online Conference, in which it will partner with several major city-based health organizations. The Fibroids Project, the brains behind the online conference, envisages making June 14th, 2014 ‘Fibroids Awareness Day,’ and hopes to bring over 1000 women to register for the online conference. 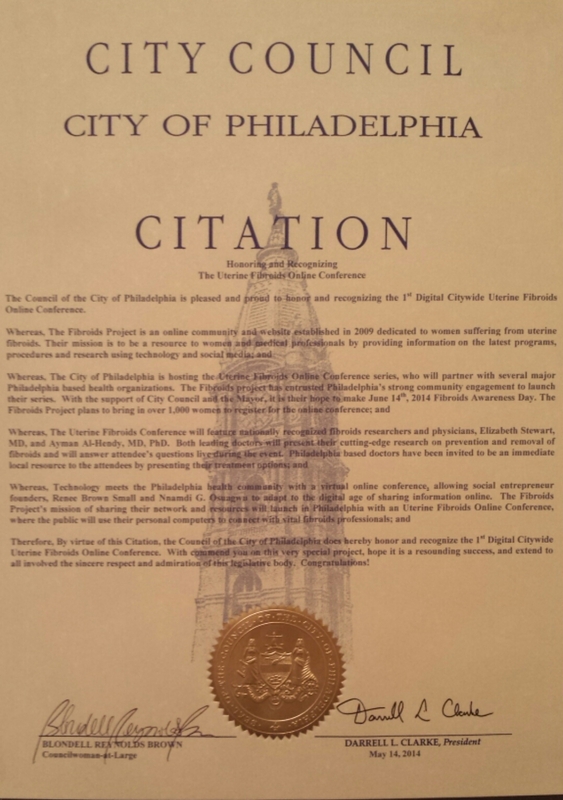 The efforts of The Fibroids Project have already been honored and appreciated by the Council of the City of Philadelphia, all thanks to the efforts of Councilwomen Blondell Reynolds Brown, who led the charge for a citation that recognizes the ‘First Digital Citywide Uterine Fibroids Online Conference’ that is taking place. The uterine fibroids conference will feature nationally recognized fibroids researchers and physicians, Elizabeth Stewart, MD, and Ayman Al-Hendy, MD, PhD. Both doctors, well known in this field, will present their cutting-edge fibroids research and will be available to answer attendees questions live during the event. Robert Worthington-Kirsch, MD who was one of the first physicians in the USA to offer Uterine Artery Embolization as a treatment for fibroids in 1994, and has treated approximately 3000 women to date. He has been a thought leader in research and teaching about this therapy for the last 20 years. Tanya Thompson, producer, actress, and former Director of Finance and Special Events for the National Academy of Television Arts & Sciences (The Daytime Emmy Awards) is a “fibroids survivor.” Tanya is bringing awareness to fibroids through her upcoming film, “The Decision” and her non-profit organization Protect Our Womb Foundation, Inc.
What is unique about this event is that a virtual conference platform is being used to meet the requirements of the Philadelphia health community. Social entrepreneurs and founders, Renee Brown Small and Nnamdi G. Osuagwu hope to bring valid solutions to the public, through world-renowned fibroids professionals, without making them leave the comfort of their homes. What has made fibroids emerge as a major challenge in the 21st century is the absence of knowledge about this medical emergency. As per a recent study, women on an average have reported to have waited for 3.5 years before deciding to seek medical help. In the case of African-American women, a staggering 77% have been shown as being more likely to miss workdays due to uterine fibroids. It is an online community and website dedicated to women suffering from uterine fibroids with a mission to be a resource to women and medical professionals by providing information on the latest programs, procedures and research.